SEATTLE, Sept. 27, 2018 /PRNewswire/ -- Alaska Airlines announced today it will begin daily nonstop service between Seattle-Tacoma International Airport and El Paso International Airport, along with daily nonstop service between El Paso and San Diego International Airport. El Paso is a new destination for Alaska. 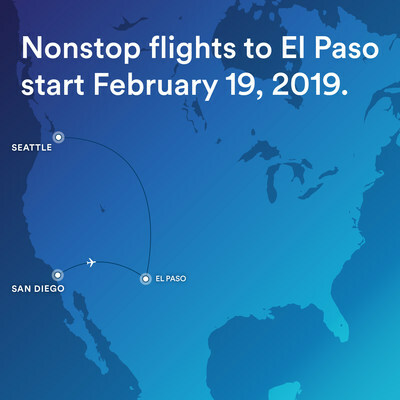 "We're pleased to add another exciting destination to our route map with our new service to El Paso," said John Kirby, vice president of capacity planning at Alaska. "We're connecting two of our key West Coast gateways – Seattle and San Diego – with our first destination in West Texas. We're bringing our low fares, great customer service and industry leading loyalty program to guests in a new region of the west for Alaska." "We are beyond thrilled to welcome Alaska Airlines to El Paso!" said Monica Lombraña A.A.E., Managing Director of El Paso International Airport and International Bridges. "Alaska Airlines enhances connectivity for both leisure and business travelers with daily flights to the West Coast and beyond. We deeply appreciate their investment in our community and look forward to a lasting and successful partnership." El Paso will become the 91st nonstop destination available from Alaska's main hub in Seattle this spring. Alaska Airlines' guests can earn and redeem miles with Alaska's highly-acclaimed Mileage Plan program, with award travel that starts at only 5,000 miles. With Alaska and its Global Partners, members can travel to more than 900 destinations around the world.